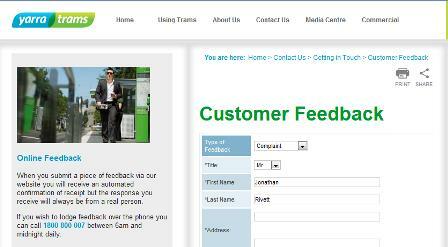 Read Yarra Trams’ scintillating reply. I love it. I love the 86. I love Preston. I laughed a little bit too hard. No, wait. I know this guy! I saw him on the 96 once, and he tried to “engage” me in what seemed like quite a philosophical discussion about whether I was a cat, and if I said I wasn’t, how I knew that. It was actually great because some ticket inspectors got on and I didn’t have a ticket, but they let me off because he was giving me so much trouble. How do you know the police hand’t been called? How do you know the delay wasn’t the fault of the police? What a longwinded waste of my time. Good Job writing in about this, something better be done about it! That’s very amusing, and while this in no way excuses Yarra Trams or the Police for their protracted response, why didn’t you just ring the Police yourself? This is great. I am regular commuter on Tram 86 from Docklands to Queent st. Most of the time this tram is late.The floors are full of empty beer cans or Mac Donald’s paper bag. You need to extremely lucky to reach the destination on time. Tram changes the route any time it wants or terminates any time.There were ticket officers on yesterday(01-05-2012 from Dockland to Queen St) and they were looking at commuters as if we are thieves. A drunk who was sitting on the tram step had a joy ride. The ticket officer didn’t even bothered to ask him for a ticket or move away to minimise inconvenience for other passengers. The seat covers so dirty so I don’t wear any of pale coloured pants.If you lean back your shirt will stick to chewing gum. Tampons can be found in between the seats, thanks for those rogue ladies atleast hiding it between the seats.Most of the times the ticket machine doesn’t work. It need an exact change or else it won’t give you the ticket. Running the red light and blocking the pedestrians is a hobby of the tram driver when it reaches the corner of Spencer st and Bourke st. Cheers bro! keep it up. Does the immaculately dressed man from Athens still ride on it, carrying his oil painting of a reposing naked lady? Funny, witty and superb grasp of the English language from both sides. And yes, Melbourne has its “eccentrics” that make tram travel an adventure of sorts. Thank you for telling them, I’m sure they know but thank you anyway. My boss showed me this after he was laughing very loud and it made my day. Using the 86 frequently makes appreciate this even more! I can’t believe The Age took me here. This is neither entertaining or interesting. You have too much time and not enough wit. I feel genuine sorrow for people who not only fail to see the genius and wit behind the original email and/or Yarra Trams’ response, but who then feel the need to use their own precious time to comment to such effect. Brilliant, the lot of it. If you and possibly a couple of other passengers had even trace amounts of testosterone in you you’d have put an immediate cease to his consciousness. As barbaric as it sounds, I concur with Brett’s sentiment of bringing the drunkard’s consciousness to an immediate cease. To the folk who are too busy and witty to post anything complimentary about this article, try to utilise your considerable intelligence and understand that you are far too superior to have been at the epicentre of Jonathan’s primary concern while constructing this piece of discourse. If you check with him yourself, you may be stunned to discover it was not written for your entertainment. It’s not all about you, Truman Show. Hate public transport, not used it in years – after this saga, I rest my case…. You have wonder exactly what the certain matter that we can’t be permitted to engage upon.